Recruited from Watsonia in Collingwood’s northern suburb heartland, Collingwood invited Browne to train at Victoria Park during the pre-season of 1981. A Collingwood supporter in his youth, Browne was one of 150 local players invited to training, who each had to fight for a spot on the list. Two of his brothers played in the under 19s and reserves, one of whom, Jeff, went on to run Channel Nine. 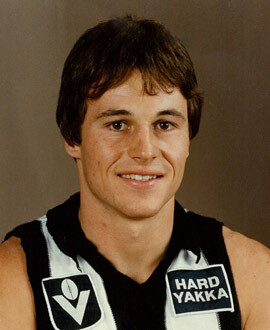 Browne played a total of 47 games for Collingwood, including 19 in 1984, when he won 21 disposals in the disastrous Preliminary Final loss to Essendon. After a quieter season in 1985, he moved to Fitzroy. “When I went over (to Fitzroy), I lost all my hunger to play league footy,” Browne said in 2012. “I played half a dozen games there but really struggled with the demands of VFL football, as it was back then, and was tearing my hamstrings…I lost my pace and I was pretty much gone by end of ‘86. Browne later became President of Collingwood’s Past Players Association and his son, Alex, won a spot on Essendon’s list.